If anyone has ever done the dolphin swim stroke where you arch your back repeatedly and kick your legs in sync will know this is no school for sissies. You have to have muscles where you didn’t know were there to make that incredibly beautiful swim stroke. Well now they apparently have a mermaid school that teaches you to do just that. Didn’t you ever wonder how those beautiful girls at the Aquarium tanks learned how to swim with those big fish tails. Well they actually went to school to do that. One woman in the UK is turning both adults’ and children’s dreams into a reality with a special mermaid academy. It’s the closest thing you can do in dreaming of metamorphosing into a mermaid. “Swimming as a mermaid is incredible. 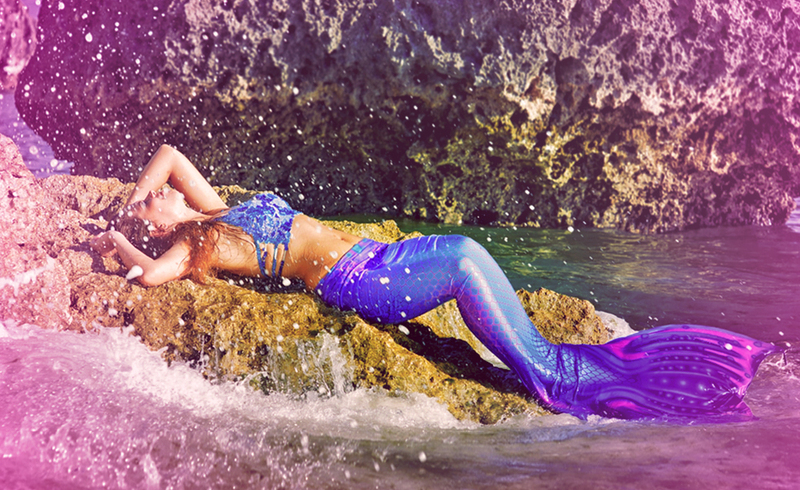 It’s peaceful, dreamy, and a lovely form of exercise wearing a beautiful tail.” Forsbrey says kids and teens are obsessed with mermaids at the moment due to watching Netflix’s ‘Mako Mermaids’ series. “They are going crazy over mermaids!” She says that mermaid tails aren’t accessible everywhere and it’s really important for wannabe-mermaids to learn the safety aspects if they want to swim like a sea creature. Forsbrey has accreditation from the International Mermaid Swimming Instructors Association and a range of swimming and diving qualifications. She’s also a qualified lifeguard and Red Cross lifesaver. So, what exactly do mermaid lessons entail? Just like swimming, mermaiding has a series of levels that you can work your way up. Beginners will learn the basics, like putting on a mermaid tail, safety and care and how to enter and exit the pool. Students will also learn basic swimming techniques, like “mermaid breast stroke”, and treading water, along with some “under water fun” like finding treasure. More advanced mermaids will learn things like breathing techniques, handstands, rolls and underwater poses. You’ll also learn choreography and will be able to make up your own routines. Fun! When watching the aquatic ballet stars of water, I was always amazed at how easy they seemed to make it when I knew what an athletic challenge it really was. Hooray for Forsbrey and her love of water to offer the opportunity to know what it is like to swim like a mermaid! Financial gain and self-worth attached to wealth. Since pulled inverted, I feel it shows Forsbrey didn’t create her school for the money, she does it because she loves the water and wants to share that love. A woman who likes to live the good life but also be of service. I believe this card shows Forsbrey absolutely enjoying the financial windfall the new interest in mermaiding is bringing her but also have a great time while earning it.